"ip authentication key-chain eigrp as-number key-chain"
"ip hello-interval eigrp as-number seconds"
Service (SMDS) networks may be considered to be NBMA. 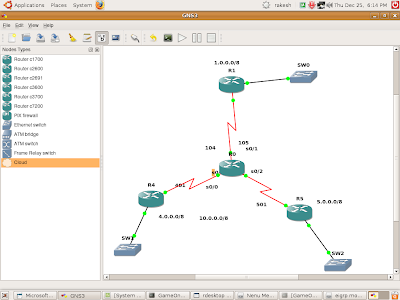 "ip hold-time eigrp as-number seconds"
FORGOT to mention there were instances where i played with "TRAFFIC SHARE MIN" and "traffic share balanced" commands ..
be routed to 501 and it has a nearest interface of s0/2 that this frs connects to. how did router at hub knew that it should foreward packet to 501 dlci and to that particular ip ???? 1.whenever you want to set up a remote desktop connection make sure your account is pass protected or have a password .. this is not for a security reason , of course it is but winxp would only allow you to remotely login if and only if you have a password ..
you need to convert the decimal address to hex .. and paste it under the config as simple as that ..
ipv6 labs are done.. there were few new concepts apart from ts and cbt ..the tunnels .. neverthless attempted and these labs are not like the usual one .. its as simple as configuring the ipv4 address .. so there is nothing to explain nor to post configs .. here are few important concepts on tunnels ..
do it on the other side of the router you should see the connectivity .. iam going into a comparison which is right or wrong .. but these are very much similar to ospf virtual links ... you can have connectivity without connectivity .. did i say anything ???? any ways author of the lab guide compare them to loopbacks .... so all in all its simple .. configure a tunnel , include source and destication and bingo ..
let us check what address we got .. although it can be seen in the debug output ..
*Mar 1 01:07:23.191: DHCPD: checking for expired leases. *Mar 1 01:12:41.975: DHCPD: DHCPRELEASE message received from client 0063.6973.636f.2d63.3230.332e.3234.3731.2e30.3030.302d.4661.302f.30 (172.16.23.101). *Mar 1 01:12:41.983: DHCPD: returned 172.16.23.101 to address pool rakesh_r3. *Mar 1 01:12:42.451: DHCPD: DHCPRELEASE message received from client 0063.6973.636f.2d63.3230.332e.3234.3731.2e30.3030.302d.4661.302f.30 (172.16.23.101). *Mar 1 01:12:42.455: DHCPD: Finding a relay for client 0063.6973.636f.2d63.3230.332e.3234.3731.2e30.3030.302d.4661.302f.30 on interface FastEthernet0/0. *Mar 1 01:12:44.443: DHCPD: DHCPRELEASE message received from client 0063.6973.636f.2d63.3230.332e.3234.3731.2e30.3030.302d.4661.302f.30 (172.16.23.101). *Mar 1 01:12:44.443: DHCPD: Finding a relay for client 0063.6973.636f.2d63.3230.332e.3234.3731.2e30.3030.302d.4661.302f.30 on interface FastEthernet0/0. now . 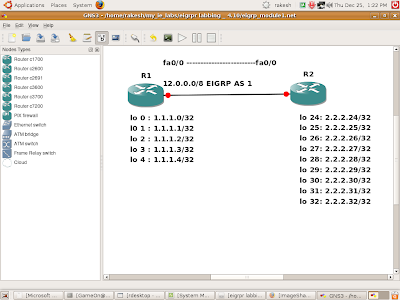 configure the debug statements on either sides and also disable ip routing on r3 . *Mar 1 01:01:23.191: DHCPD: checking for expired leases. *Mar 1 01:03:06.335: DHCPD: DHCPDISCOVER received from client 0063.6973.636f.2d63.3230.332e.3234.3731.2e30.3030.302d.4661.302f.30 on interface FastEthernet0/0. *Mar 1 01:03:08.343: DHCPD: assigned IP address 172.16.23.101 to client 0063.6973.636f.2d63.3230.332e.3234.3731.2e30.3030.302d.4661.302f.30. *Mar 1 01:03:08.347: DHCPD: broadcasting BOOTREPLY to client c203.2471.0000. *Mar 1 01:03:08.391: DHCPD: broadcasting BOOTREPLY to client c203.2471.0000. *Mar 1 01:03:23.191: DHCPD: checking for expired leases. r2(config)#ip dhcp excluded-address 172.16.23.1 ? r2(config)#ip dhcp excluded-address 172.16.23.1 172.16.23.100 ? r2(config)#ip dhcp pool rakesh_r3 ?